Summary: The Creation is broken, as are we creatures living therein. Both observation and revelation testify to this ugly truth. Indeed, we are so far away from what God intended us to be that His image is illegible to Him, to others, and to ourselves. Christ came to redeem mankind and to usher in the New Creation. By His suffering and death and through His Word and Spirit, He makes us citizens of the New even as we continue to live (and die) in the Old. He unites mankind’s disparate parties, not only Jews and Greeks but all of us divided by age, geography, language, culture and the like, into one body — His body, the Church. And just as He re-creates each of us individually, so also He remakes the entire body, a task completed when we are raised from the dead and gathered to live in His presence evermore. Text: Therefore remember that at one time you Gentiles in the flesh, called “the uncircumcision” by what is called the circumcision, which is made in the flesh by hands — remember that you were at that time separated from Christ, alienated from the commonwealth of Israel and strangers to the covenants of promise, having no hope and without God in the world. Restore us to Creation’s plan. Praise Christ, who paid the frightful cost. Hymn text © 2014 Walter P. Snyder. May not be used or reproduced without permission. Audio: Click to hear the MP3 of Recreated, preached at Saint Paul Lutheran High School, Concordia, Missouri. Note: For some reason, a few people have had problems trying to play the inline audio if Windows Media is their default MP3 player. If this occurs, you can either change to QuickTime or another default browser player, copy and paste the link directly into a selected player, or download it to your computer, where it seems to work regardless of which player. Several folks have suggested VLC Player from VideoLAN. 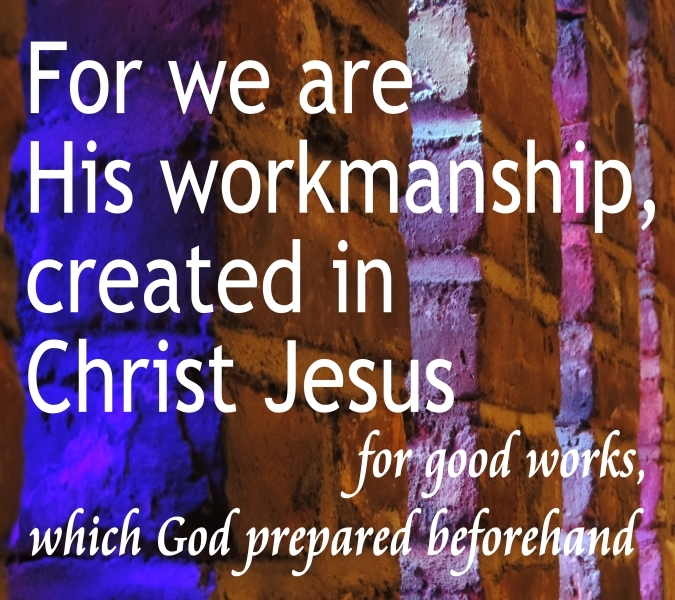 About the Service and the School: The theme for the 2014 – 15 academic year at St. Paul Lutheran High School is We Are God’s Workmanship, taken from Ephesians 2:10. Under this theme are monthly emphases and weekly foci. September’s emphasis is “We Are God’s Workmanship in Christ Jesus,” with an emphasis on Christology. Time is at a premium for the SPLHS chapels, so I tried to make a few quick, concise Law applications both to students and to teachers and to bring the Gospel’s forgiveness and Christ’s encouragement to each. While certainly a Lutheran educational institution, St. Paul is also a mission field. Not only does it admit academically qualified Lutherans, the school also welcomes a number of other Christians as well as non-Christians — even some atheists. A high percentage of students come from other lands, so chapel speakers must tailor their messages age-appropriately while remaining mindful of those unskilled with English, uncomfortable with Christianity, or both. The school regularly enrolls American students and others born in Slovakia, Norway, China, Madagascar, Japan, Vietnam, Hong Kong, and elsewhere.